Patented version with a closed tank. 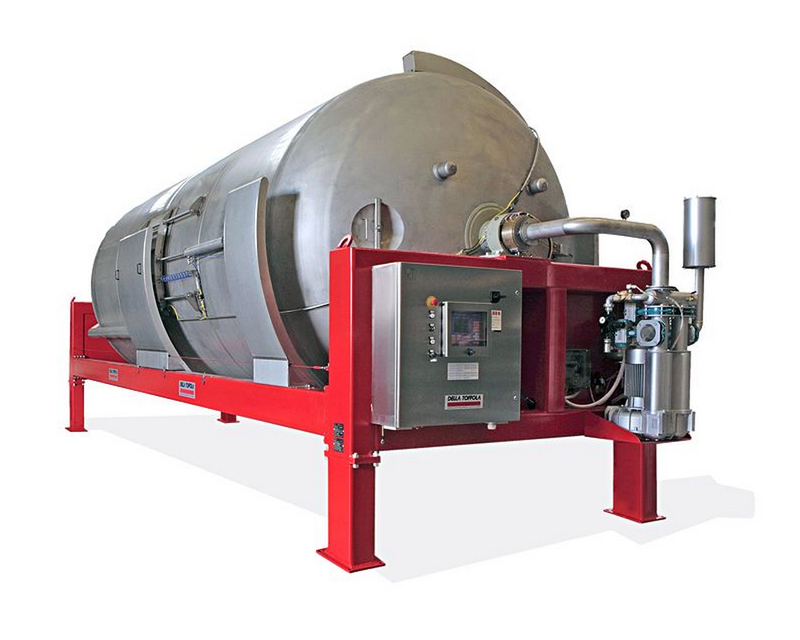 Della Toffola offers a range of presses with closed tanks that have innovative features. These presses have a tubular membrane made of non-toxic material, attached to a winged supporting element; this membrane (which always remains basically in the middle of the drum) and the supporting element are then mounted on the axle of the stainless steel perforated drum. The must squeezed out by the action of the membrane flows through channels in the form of a perforated grid attached to the inside of a conveyor chamber. The most interesting novelty of these models lies in these channels for the runoff of the must. Instead of being straight, as in all the other presses, the channels in the PEC/PFC models made by DELLA TOFFOLA are round – or rather they are circumferential. As this term suggests, the channel occupies and exploits the whole circumference of the drum, at least doubling the useful must straining area by comparison with a standard system. The grids are attached inside the tank and arranged to form rings around its central axis; the chambers for carrying the must are as wide as the perforated grids, and are created inside the tank. This assures a fast and effective, unhindered straining action. There will be no more troublesome clogging to reduce the press’s output and demand lengthy servicing procedures. With this type of grid the flow of must suffices for an effective and continuous cleaning of the holes through which it drains; this fact also considerably facilitates the periodic cleaning of the press with sanitizing agents. For a quick and easy check on the condition of the grids, and to clean them if necessary, all the operator has to do is loosen two screws and the channel can be removed and inspected with ease. For easy access to the tank, the operator can open the loading hatch, then clean the drum through the oval hatch. It is easy to see the exceptional return in terms of output and economy of operation that this solution offers by comparison with a conventional machine, i.e. inside the press, the product is distributed in an even, thinner layer and the must is strained over the entire surface of the drum. Thanks to these features, the quality of the must improves considerably. In fact, the crushed grapes are exhausted under a lower working pressure, with fewer pressing and crumbling cycles, giving rise to a clear, top-quality must with low levels of polyphenols (waste substances that make the must cloudy). The mass of grapes to crush in the drum undergoes no lengthy manhandling and its own weight already prompts the straining of a considerable amount of fluid through the whole surface area of the channels. The maximum crushing pressure (which never exceeds 1.5 bar) is only needed for a few short cycles at the end of the program. The models up to the PEC 100 incorporate a device for inflating/deflating the membrane, while the larger models are used with a separate unit. Thanks to the extremely flexible and user-friendly programming system, there are no limits to the type of grape that can be pressed. In fact, the control panel is complete with a programmable computer (PLC) for the automatic completion of all the processing stages. Underneath the press there is a tank for collecting and transferring the must coming from the drum. 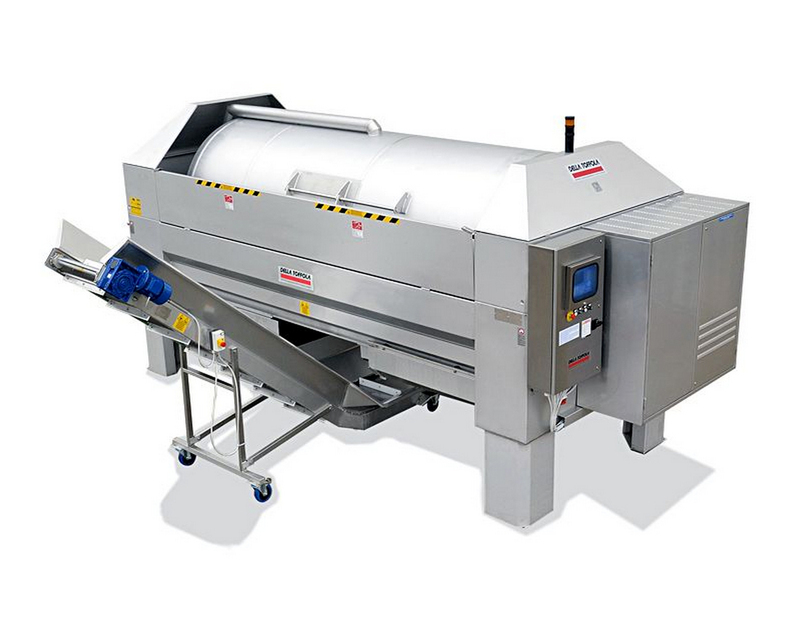 At the end of the working cycle, the press can quickly unload the grape marc and the cleaning of the press is made simple by the absence of any internal manifolds, which make the cleaning procedure far more troublesome. 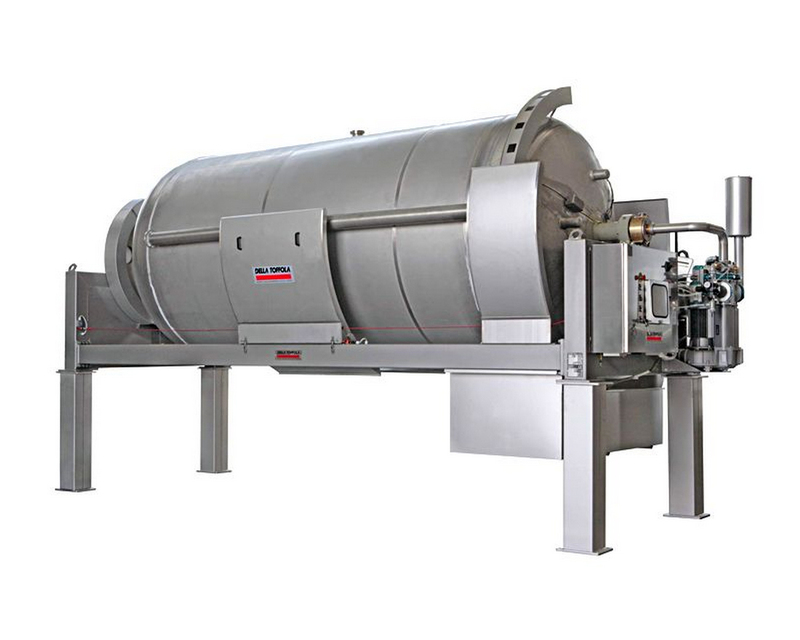 The washing procedure is also facilitated by a specific second oval hatch that makes it easier to access the inside of the drum. To further facilitate the washing process, between the two hatches on the drum there is also a DIN-standard pipe fitting. In addition to the already excellent return in terms of product quality and quantity, and the halving of the processing times, Della Toffola’s presses also ensure a whole set of other advantages for a cost-effective operation, i.e. cavity-type cooling systems can be applied to the outside of the drum for carbonic maceration processes under controlled temperature conditions.